Introducing the StumpTown 100% Cotton Ripstop Kilt. Extreme durability with the our classic STK design and box pleat styling plus lightweight comfort for those hot Summer months. 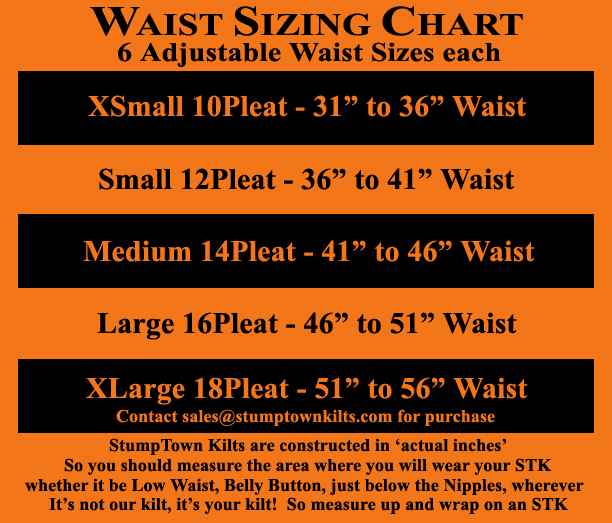 These pre-shrunk 6.5oz Stumptown’s are lighter than our Standard and specially weaved to isolate rips and tears. Ripstop STK's include a Small Attachable Pocket, which attaches to the Bandoleer. For crisp pleats remove from dryer while slightly damp. Smooth pleats with your hand, fold in half, fold in half again, and clip hang. Note: Unlike our Standard Twill, 100% Cotton will shrink slightly in wash the same as the denim pants you just threw out of your closet and replaced with all StumpTown Kilts! Each color is a representation of a color standard and is subject to shade and weight variation per fabric lot, such as future orders of Attachable Pockets could vary in shade for your STK. While all of our fabrics are heat treated for color/light fastness and pre-shrunk, bright and deep colors should not be mixed with white or light colors in wash. As per our fabric supplier, no guarantees can be made regarding lightfastness or color transference during washing or cleaning. Fabric finish weight may vary. 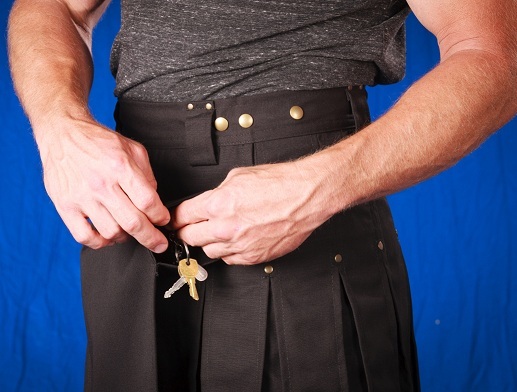 25" Kilt - Pants Inseam 35" to 36"
Each kilt comes with 6 adjustable waist sizes using a snap system, allowing the kilt wearer to adjust the kilt to accommodate for any weight fluctuation. 100% Cotton Ripstop. Gets softer as you wash it. 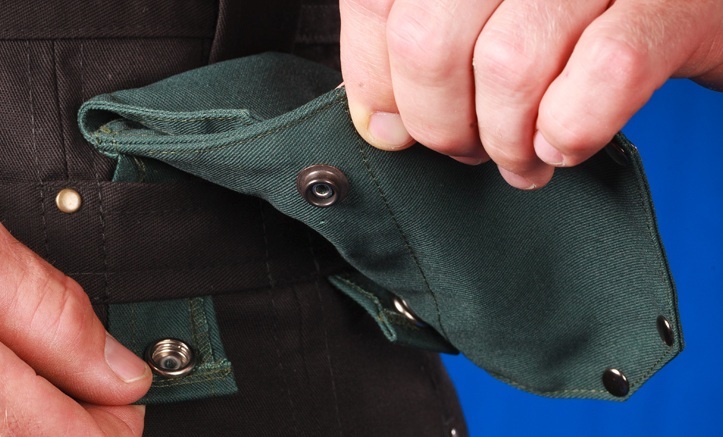 Men's Attachable Pockets are more stylized than your typical sewn on floppy cargo kilt pockets, providing plenty of storage for your personal items. Highly functional and durable for rugged abuse on the trail or for everyday wear. 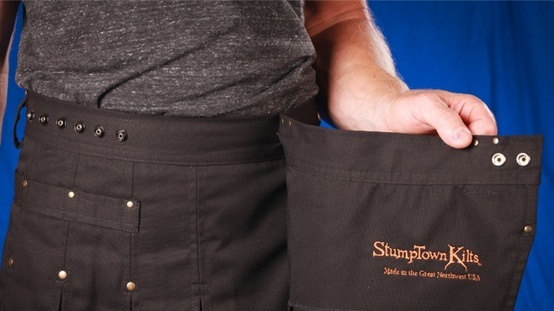 StumpTown Kilts is the first modern kilt to offer an attachable pocket strap (bandoleer) positioned along the waistline of the kilt, giving you the option to wear your kilt with or without pockets. Simply add pockets to get a utility look and feel or without pockets for a dressier look. It’s your kilt. Customize it the way that best fits your activities or personal style. The bandoleer also provides great attachment points for clips, D-rings, carabiners and alike and is reinforced with bar tacking and rivets for added strength. Attachable Kilt Pockets sold separately. Deep Internal pouch pocket located in the front apron of the kilt, providing plenty of storage. Custom pleat design to prevent puffiness or curling of the pleats. StumpTown Kilts utilize a box pleats sewn on the inside and outside of the Kilt further preventing wrinkling or curling.